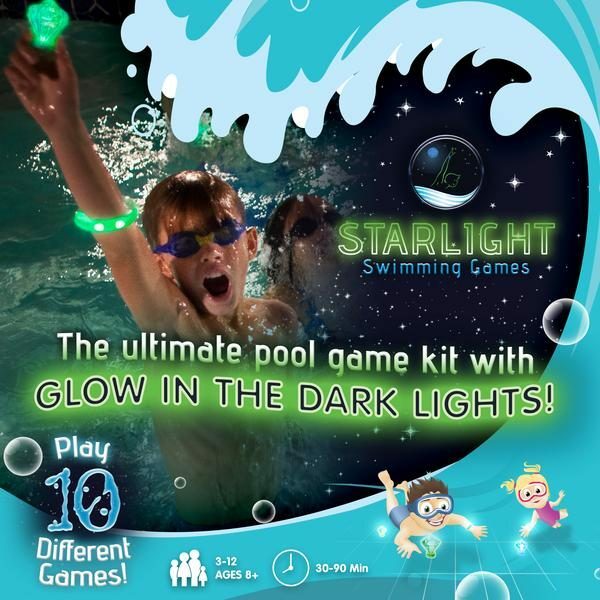 Experience the fun, new way to enjoy your swimming pool – with glow-in-the-dark game lights! 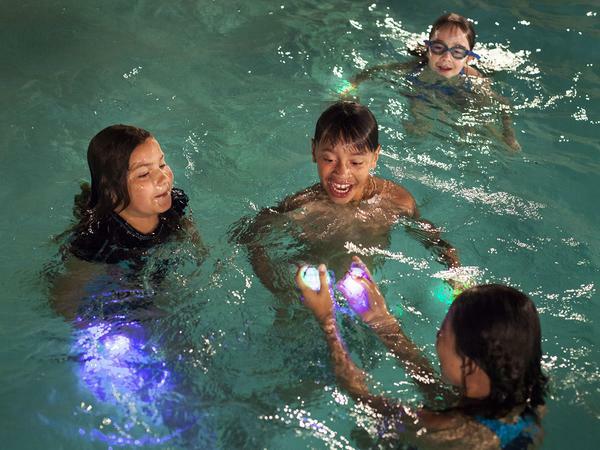 Play ten different swimming pool games after sunset using these waterproof light up game pieces. The most common ages of our players are 5-14 but something we’re proud of is the way that multiple ages can play together. We’ve literally seen grandparents play with their grandchildren. It also works great for birthdays, family reunions, camps and icebreakers. It ranges from 2-12+, depending on the game chosen and the size of the swimming area. Treasure Hunters is fun even with just two players while Flower Push Relay is perfect for large groups like swimming teams and parties. You also can use the kit as decoration for pool parties! Can I only play it in a pool? This depends on the specific game and the specific setting. For instance, What Time is it Dr Shark would be fun in a lake but Treasure Hunters would not (for fear of losing the game pieces). The biggest concerns are losing the game pieces and safety, as with any swimming game. 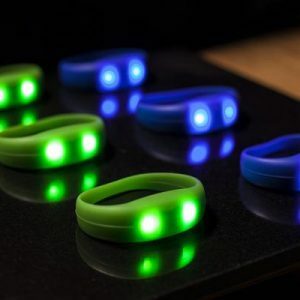 To turn on the bracelets, simply press down between the two lights. For all other lights, turn them on by twisting the base while gripping the rest of the light. With the exception of the bracelets, the batteries are 100% replaceable. To replenish them, use 2 CR2032 watch batteries for each light. Swimming pools are a lot of fun but eventually, kids can run out of things to do. This game brings to the pool hours and hours and loads and loads of fun, not just for kids but for all members of families and groups. The variety of pool activities that comes in such a small box is remarkable. This kit is awesome. The glowing lily pads are especially cool. So are the diamonds. It is surprising how many game variations come with it, and all of the games are super fun. So you can constantly change it up, and keep the pool entertaining. My kids and their friends ended up having such a blast playing the games. The glow in the dark peices take everything to a whole new, more fun level! I love that that there are so many different game ideas to choose from to play too. If our hotel pool had been bigger or not so many other hotel guests had been in it, the kids would have kept playing for hours. 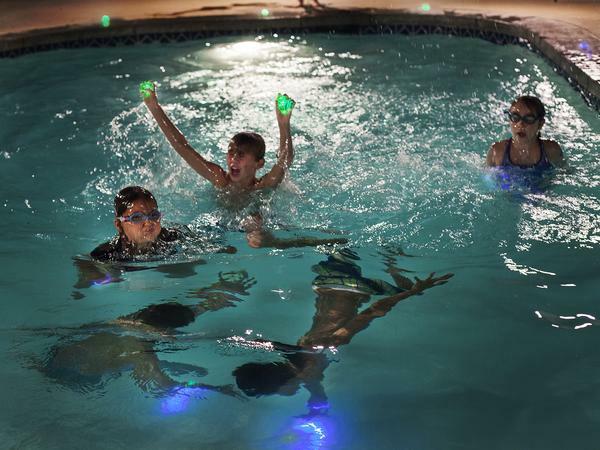 As we were going back to our hotel room, my son and I overheard three mothers talking about each of the the “cool” glow-in-the-dark pool games we had been playing. They then asked where they could get the games themselves. We are excited to try this out in our above ground pool too but darker outside and with no pool lights!! When all of my six kids get along, then that’s saying something! 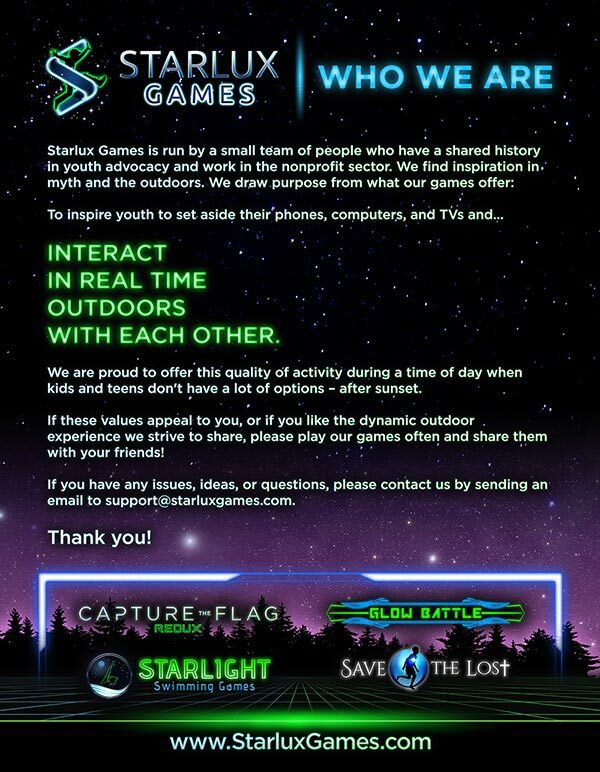 Starlight Swimming Games made it happen. 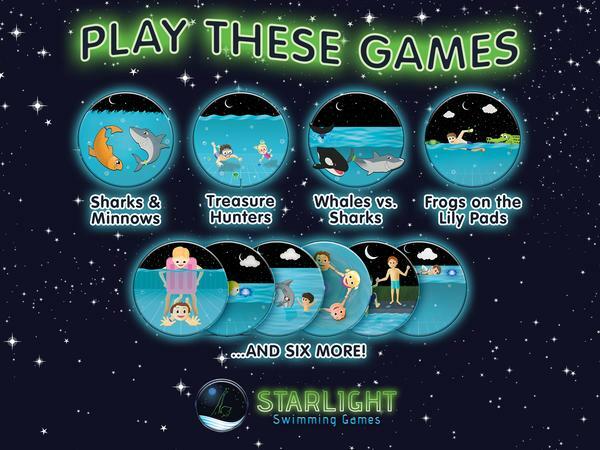 These games are a fantastic way to get them all in the pool together and having fun after the sun goes down. 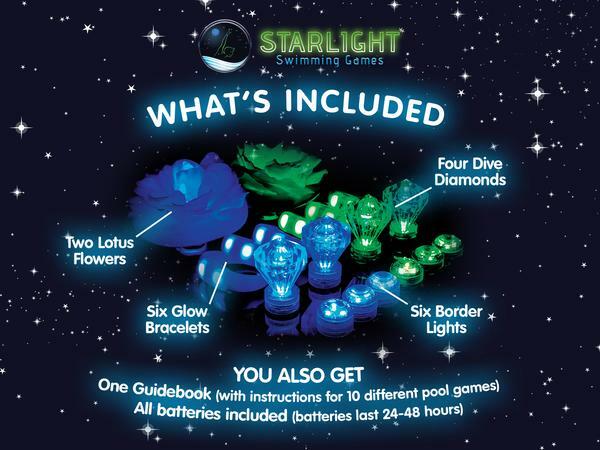 The glow-in-the-dark games pieces are really bright and easy to see, even in the deep end. And, the game cards gave my kids lots of ways to play. We have kids of all ages, and they all played together. They love it when their friends come over and we get it out. 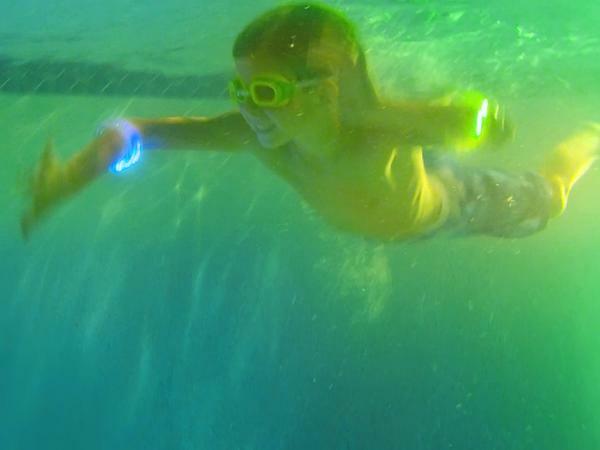 Sometimes, we just throw the glowing pieces in the pool in the evening to make it look cool! Plus, love that it comes with extra batteries. Awesome game! The pieces are easy to see in the water and seem sturdy enough for lost of games. The kids love it!